The Madeo Food Company is located in the sub-mountain zone of Sila Greca in the province of Cosenza, more specifically in the municipality of San Demetrio Corone. 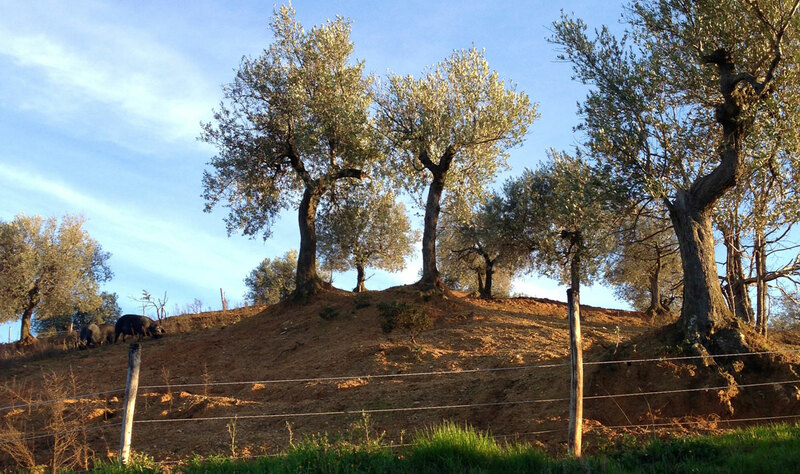 Characteristic for this area are the olive groves, untouched vegetation and the typical climate with cool summers, mild winters and year-round fresh air. This is as a result of the particular location in the middle of the two seas of Calabria, namely the Ionian and Tyrrhenian Sea. The territory guarantees optimal conditions for the native pig breed “Suino Nero”, which in this region, is their ideal habitat. Due to the wild or semi-wild farming, the pigs can peacefully roam the local land in search of herbs, roots and olives, which, along with seasonal vegetables, corn, barley and field beans, are their main food source. All of the feed is produced within the Food Company. The growth rate and the reproduction of the pigs are in harmony with the current standards and in harmony with nature. The Madeo Food Company has always promoted the enhancement of excellent products that the territory has to offer including the production of origin protected products (D.O.P.) and products of the native pig breed “Suino Nero di Calabria”. In 1990, a long process of selection and recovery of the original genes of the native pig breed began with the detection of some male and female specimens in the areas around the Sila Greca and the Aspromonte. Today Madeo represents one of the most important Food Companies in Italy producing the native pig breed of Calabria, which revalues the pork through a healthy diet and the constant attention to animal welfare. This was also shown by a number of different studies of the Universities of Cosenza, Reggio Calabria and the latest in collaboration with the Veterinary Faculty of the University of Bologna. The collected data of the study regarding the animal husbandry in the Food Company confirms that the diet and the extensive rearing of the pigs are indispensable to ensure the desired nutritional characteristics for the meats and “lardo” (type of salumi made by curing strips of fatback with rosemary and other herbs and spices). Precisely these qualities make them very healthy food products that are not only useful in the prevention of heart and cardiovascular diseases, but also an ideal element of a balanced diet for all types of consumers. Low level of oxidation and rancidity of fats what guarantees important properties such as the extended product lifetime.